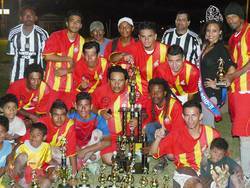 Home » Sports » San Mateo Bombers are 6-a-side Tournament Champs! San Mateo Bombers are 6-a-side Tournament Champs! On Sunday, February 27th, the Saca Chispas field was alive as football players and spectators were on hand for the official ending of the San Pedro Town Council (SPTC) 6-a-side tournament. After elimination games held from February 16th through February 24th, the winners were clearly the San Mateo Bombers. They took on the San Pedro Police Department (SPPD) during the final games, and emerged victorious. Sunday night started with a game between an All-Star Selection and the champions. After a tight game, during which no goals were scored, a small ceremony was held honoring the players, the referees, spectators and coaches. 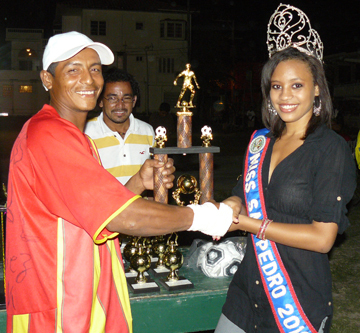 Miss San Pedro Natasha Stuart gave a brief welcome address, after which Deputy Mayor Pablo Ico commended the players and organizers. The trophy presentation began with the MVP award, which went to Victor Hernandez of the San Mateo Bombers. 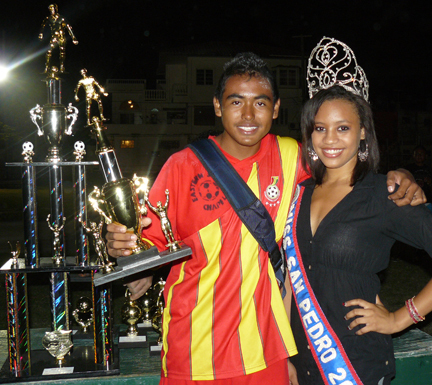 Luis Hernandez, also of the San Mateo Bombers, won a trophy for the most goals scored. The second place SPPD players were then called up to get their trophies, amid loud cheering and celebrations. The captain of the San Mateo Bombers proudly took the first place trophy, and each player was called out for their individual trophies as well. All in all, it was a great tournament, and it is definitely thanks to all the participating teams: Mata Chica, San Pedro Strikers, San Pedro Fire Blazers, Tropic All-Stars, SPTC, SPPD and San Mateo Bombers. Caribbean Depot, Bermuda Beach Resort, Coastal Express Water Taxi, Grand Belizean Estate and Grand Colony are thanked profusely for their generous sponsorship of the 2010-2011, 6-a-side Tournament. Councilor Joseph Elijio also thanks all the businesses and teams that part-took in sporting events that took place during his time as Sports Coordinator. Congratulations to the winning teams, and kudos to all participants for their efforts.